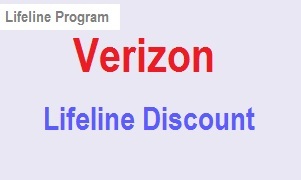 Verizon Wireless offers a monthly discount to Lifeline qualified customers. The Verizon Lifeline discount is at least $9.25 on the monthly bill, and the eligible Tribal Land subscribers can get a 100% discount of the customer's one-time activation fee. Here we’ll preview the Verizon Wireless Lifeline plans for cell phones and the home phone. Also, we will review the Verizon Lifeline eligible states, how to qualify, and Lifeline program restrictions. To receive the Verizon Lifeline discount you’ve to be eligible for the Lifeline Program, which is a government program that offer discounts on the monthly phone bill like Verizon Wireless or offers free phone service plus free smartphone like Q Link Wireless and Assurance Wireless. The Lifeline program eligibility varies by state and citizens can subscribe based on low-income or based on receiving assistance from a government benefit program like Medicaid, Food Stamps, or Federal Public Housing Assistance (Section 8). If you need info about the Lifeline visit the free phones for seniors. Verizon Wireless offers the Lifeline discount in Iowa, North Dakota, New York, and Wisconsin; not all areas in these states are covered by the Lifeline service. No more than one Lifeline discount is allowed per household. The customer's address must be in an area where Verizon Lifeline service is available. Verizon Wireless offers two monthly plans; one for the cell phone customers, which called the $25 plan and the Home phone connect plan, which is the Verizon Lifeline telephone plan. Domestic long distance calls are included. Unlimited Local Mobile to Mobile Calling Minutes. Overages: After the plan minutes run out, you’ll pay 45¢ per minute. To know more you can check out the Verizon page. To get this plan after qualifying for the Lifeline program, you’ll need a Home Phone Connect device. The plan includes unlimited minutes domestic long distance calls are included. The plan cost is $10.74 per month after the discount and there’s a $35 one-time activation fees, Tribal Land subscribers can get a 100% discount of the customer's one-time activation fee.